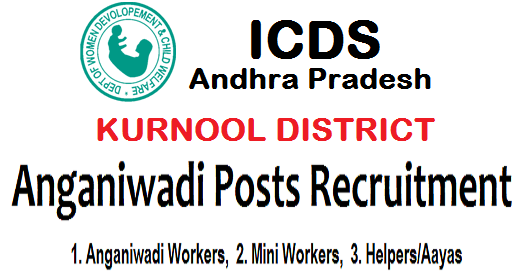 Kurnool District Anganwadi Posts Recruitment 2018: Anganwadi Workers(AWW) , Mini Anganwadi Workers, Anganwadi Helpers(AWHS)/Aayas Posts in Kurrnool District: Women, Children Welfare Department, Kurnool District, Andhra Pradesh has issued Anganwadi Workers and Helper Posts 2018 recruitment notification on 7th, October 2015 for filling up the vacant posts of Angawadi Workers, Helpers, Mini Workers in the Kurnool District. Candidates should have age limit between from 21 years to 35 Years as on 01.09.2018. 1. Anganwadi Workers: Candidates should have SSC/10th Class from recognized Board. Candidates can send their filled in application along with all relevant documents to the Concerned CDPO Office.